Quickly get up to speed on your new Drupal website by following along with this chapter. In this overview, you will create content, enable the contact form, add blocks to the left and right sidebars, and explore your site's permissions. At the end of this chapter, you'll have a fully functional website. You will also have explored the most common administrative functions and settings. The topics covered in this chapter are done at a high level to quickly introduce you to the various administrative areas of Drupal. Once you feel comfortable with the exercises performed in this chapter, you'll be ready to move on to the subsequent chapters that cover these areas, functions, and settings in greater depth. You have a message. You want to be heard, or maybe your client does. In either case, one of your first steps will be to add content to your site. 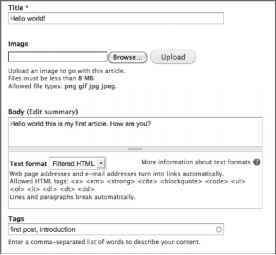 Drupal's default installation provides two types of content: Articles and Pages. Both of these items are known as nodes in Drupal's terminology. The concept of a node is important to understand because nodes share a common set of attributes and features. For example, all nodes can receive comments and be available in RSS feeds. Also, other modules can add features to nodes, extending a node's functionality. An example of this is the contributed Fivestar module, which adds the ability to rate content. In the following two exercises, you'll explore the differences between an Article node and a Page node. One of the first things you should notice is that the Article and Page creation page look nearly identical, with just a few differences. After the exercises, it should be apparent why this is. 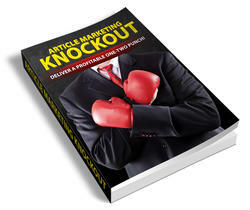 This exercise walks you through the steps to create an article entry. Log into your website as an Administrator. Click Add Content in the top menu as shown in Figure 3-1. Click Article under Add New Content. Body: Hello world this is my first article. How are you? (optional) Upload an image to be shown within the article. 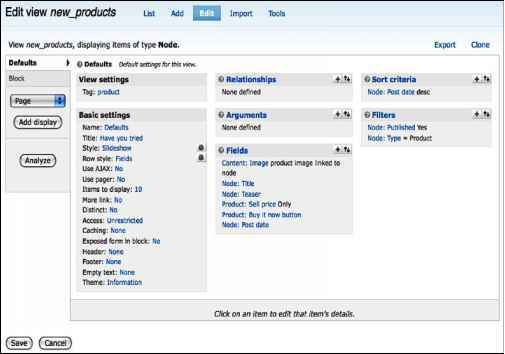 An Article is a node type, also known as a content type in Drupal. Articles are typically used for news, updates, and other constantly changing content. Articles, like all nodes, are created through the Add Content screen. Every node type shares a common set of attributes, although they vary in their defaults and where and how they appear on the website. This will become more apparent after the second exercise. This exercise walks you through the steps to create an About Us page. 1. Click Add Content in the top menu as shown previously in Figure 3-1. 2. Click Page under Add New Content. ^ Body: As a new website we provide our readers with excellent and fresh content. Pages are the static pieces of your website that are typically reserved for site necessities such as About Us, Directions, or a copyright notice. The Add Content screen is similar to that of an Article, because both items are nodes. If you compare the Create Article screen (Figure 3-2) and the Create Page screen (Figure 3-3), the first difference you will see is that an Article has an image upload form and allows for Tags (categorization). Pages only have a title and body. This is simply a Drupal default. A Page can be modified to have Tags or its own categorization system, pages can also accept images or file uploads. You will learn how to modify these settings in Chapter 6, "Content." Now compare the lower portion of each screen as shown in Figure 3-4 and Figure 3-5. Enter a comma-separated list of words to describe your content. Full text (Edit summary) Hollo work! this is my first artlde How are you? The maximum depth for an Item and all its children is fixed at 9, Some menu items may not be available as parents if selecting them would exceed this limit. As a new website we provide our readers will excellent and fresh content. appear in the menu. Leave blank if you do not wish to add this post to the menu. parents if selecting them would exceed this limit. Note that the Comment settings on an Article are set to Open, whereas the settings for a Page are set to Closed. The Publishing options also differ, with Article set to Published and Promoted to Front Page, and Page set only to Published. These defaults reflect how you want the respective pieces of content to appear on your site. If it hasn't become clear by now that Articles and Pages are both based on nodes, let it resound in your memory forever. Understanding the concept of a node is important when you want to add new types of content such as events, images, or videos to your website. In Drupal, you look for the functionality that you want to add, instead of a module that provides you with a specific content type. For example, the embedded media field module (http://drupal.org/project/emfield) adds the ability to insert Flickr photos, YouTube videos, Last.fm music, and many other forms of media directly into any node (i.e., content type) on your website. In Chapter 6, you will learn more about nodes, including how to modify their defaults and create your own content types. When creating your first article, you may have noticed the Edit Summary button (shown previously in Figure 3-1). A Summary is also known as a teaser, the part of the node that is shown on your site's frontpage. It is also used in your site's RSS feeds, tempting the user to click the Read More link. Clicking this link will display a new Summary box above the Full Text box as shown in Figure 3-6. If you do not enter a Summary, the default set for each content type will automatically create one for you characters of your Article. Hello world welcome to m y first Article post! Click Read m ore to continue reading. Hello world this Is my first article. How are you? So far this chapter has stated that you can change the defaults for nearly everything. But where should you start? You can modify the defaults for each content type at Structure C> Content Types, as shown in Figure 3-7. Select Edit to the right of the content type you want to modify. The following screen will display all the default options available for that content type. For example, you can configure the length of the summary under Display Settings, as shown in Figure 3-8. Manage tagging, categorization, and classification of your content. Enable the submitted by Username on date text. The maximum number of characters used in the trimmed version of content. NOTE Changes to the Display Settings will take effect on all new content created after the setting change, in other words this setting is not retroactive. Now that you have an About Us page, follow the next exercise to place a link in your top menu (Figure 3-9), to provide easy access for your site's visitors. This exercise walks you through adding the About Us page to the Administration menu. 1. Navigate to the About Us page you created in the previous Try It Out exercise. If you cannot locate this page, click Content in the upper-left corner. 2. Click Edit on the About Us page. Menu items by clicking Structure in the Administration menu. Go to Administer O Menus (under Structures) O Add Link next to the respective menu (in this case, the Main menu). 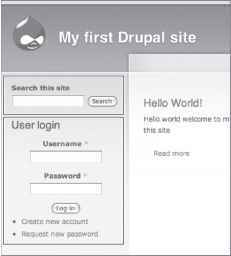 Drupal contains several menus by default, and you can create many more. As you have already seen, the Main menu is the menu displayed at the top of your site. Menus are also provided for administration, management, site navigation, and user account links. These are all explored in-depth in Chapter 5, "Administration— Blocks, Menus and Themes." Menu Link Title: The text that will appear to the site visitor (such as "About Us"). <menu name>: The < > indicates that this item is a separate and independent menu. Figure 3-11 displays two menus: Main Menu and Management. -- : Two dashes indicate that the item is located underneath a menu. Each subsequent two dashes indicate than the item is a child of a parent. Article and Page are children of Add New Content and are located within the Management menu. 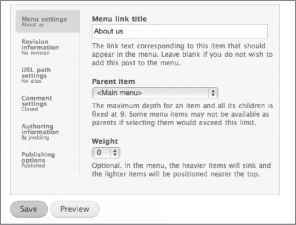 Weight: Every link in a menu is first ordered by its weight and then alphabetically. Links with lower numbers are listed higher than the higher (heavier) numbers. To reorganize your links, just use the drag and drop interface in the Menu administration page. Blocks are the pieces of content that typically flank the left or right side of a website. Recent comments, latest users, a navigational menu, advertisements, or a box of RSS feeds are all examples of blocks. Figure 3-12 displays two blocks in the left sidebar region of Drupal's default theme: Search and User Login. In this exercise, you enable a few useful blocks and explore the concept of Drupal's regions and blocks. Log into your website as an Administrator. Click Structure in the Administration menu at the top of the screen, and then click Blocks. Drag the Recent Comments block from the Disabled section to underneath the Right Sidebar. Do this by clicking and holding the cross symbol to the left of the block's name. Blocks are placed within Regions on your site. A Region is defined by the site's theme, so each website may not have the same regions. Drupal's default regions are Header, Footer, Left Sidebar, Right Sidebar, Content, Highlighted Content, and Help. When you are on the Blocks admin page, you can see that each region is highlighted by a dotted border box with the name of the region (see Figure 3-14). Dragging the blocks from the Disabled area to the Right Sidebar region enables the block and sets its order. You can reorder blocks by simply dragging them up or down on the screen. The order in which they appear on the Block admin page is the order in which they will appear to the user. Allowing site visitors to contact you is an essential piece of any website. Drupal's Contact module (which is disabled by default) provides a quick and simple mechanism for site users to contact one or a group of e-mail addresses. Users may also select from a list to direct their inquiry to the right person. For example, inquires to "Report a bad link" could be directed to the site's webmaster, whereas inquires to "Contact us about advertising" can be directed to the sales department. In the following exercises, you enable and configure the Contact module. In this first exercise, you enable the Contact module. 1. Log into your website as an Administrator. Click Modules in the Administration menu at the top of the screen, as shown in Figure 3-15. Download additional contributed modules to extend Drupal's functionality. 2. Under the Core module category, enable the Contact module by checking the box to the left of the name. Before the Contact module can be used, it must be enabled. Enabling a module in Drupal is as simple as checking the box next to it and saving the page.